Faith leaders gather to learn about proposed abortion legislation. Published 4/5/2019. Local. In his welcoming remarks, Cardinal Seán O'Malley spoke of the Church's advocacy for women facing crisis pregnancies and its belief that society can offer "a better response" than abortion. "We do not seek special status in law or public policy to impose religious views on society. 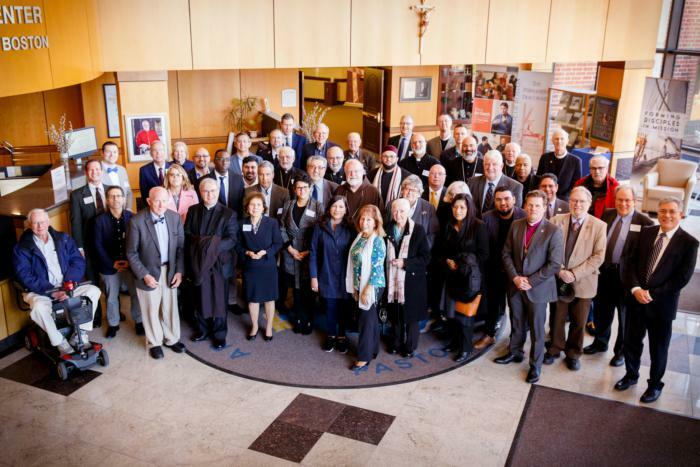 We seek to be a voice of reason with concern for human rights," Cardinal O'Malley said. Father J. Bryan Hehir, the archdiocese's secretary of health and social services, explained the substance of the two companion bills, House Bill 3320 and Senate Bill 1209, the Act to Remove Obstacles and Expand Abortion Access, also known as the ROE Act. Father Hehir said this legislation is emerging now, decades after Roe v. Wade was decided in 1973, because abortion advocates are concerned about possible changes in federal law regarding abortion. He said the Massachusetts bills are part of a national campaign to ensure abortion access through state law. He said the purpose of the meeting was to identify how the proposed legislation goes beyond merely codifying Roe v. Wade. S.1209 would allow late-term abortions (after 24 weeks gestation) in cases of "lethal fetal anomalies" and allow such abortions to be performed outside of hospitals. The bill would also repeal a provision that physicians must provide medical care to infants born alive during an abortion, and remove criminal penalties for failure to do so. It would also eliminate the requirement that a minor seeking abortion have parental or judicial consent. Father Hehir acknowledged that obtaining parental consent can be complicated if a pregnancy occurred in the minor's home, but in current law, a court could be consulted. S.1209 would expand taxpayer funding of abortion. If a woman did not qualify for MassHealth, funds from the Healthy Start program, a public health initiative intended to reduce infant mortality by providing maternity care, could be used for her abortion. Father Hehir said the language of the bill "depersonalizes the meaning of abortion" and "dehumanizes the choice that people make in very difficult circumstances." He said that post-abortive women that the archdiocese helps through Project Rachel describe abortion as "a profoundly human experience." "The legislation does not allow one to grasp the full meaning of abortion in terms of either the life of the unborn child or the life of the woman who makes that choice," Father Hehir said. He said the legislative proposals are not known to the public, and the first step in preventing their passage is to raise awareness. George Cronin, the managing director of the public relations firm Rasky Partners, explained the "legislative context" of the bills to the faith leaders. He said Massachusetts uses a two-year legislative process. The current process began in January and will end July 31, 2020. He said there are approximately 7,000 bills currently filed for consideration. "There's very low awareness of this issue in the State House right now," Cronin said. He said that judging from conversations he has had so far, "this bill is not seen as an abortion bill. This bill has been framed inside the State House as an anti-Trump measure" and a "preemptive strike" against possible changes in federal law. Both bills have received committee referrals. H.3320 is before the judiciary committee and S.1209 is before the Public Health Committee. Each committee will have a public hearing about their respective bills. These hearings have not yet been scheduled. Father Hehir noted the importance of language used in discussing the bill. He said the language used in the bills is "extreme," whereas the language faith leaders use in discussing the bills with their communities must be "moderate," "rooted in truth," and "precise." He opened the discussion by inviting Marianne Luthin and Fran Hogan, both members of Cardinal O'Malley's pro-life team, to share their thoughts. Fran Hogan, an attorney and member of the Massachusetts Catholic Conference, said that she spoke with a state representative who co-sponsored the ROE Act because he was told it would protect Roe v. Wade in the event that the Supreme Court overturned the ruling. As the father of two teenage daughters, he was, Hogan said, "appalled" to learn that it would allow a young girl to have an abortion without anyone knowing. "It's important to tell them, 'We're not here to change your mind on abortion. We'll set that aside for another day.' We want to focus like a laser beam on this legislation and its extreme nature," Hogan said. In his closing remarks, Cardinal O'Malley said that the questions and suggestions raised during the discussion reminded him of the words of St. Ignatius of Loyola: "We have to work as if everything depended upon us, and pray as though everything depended upon God."